Over the past year we’ve been carefully watching the evolution and spread of a novel swine flu variant called H3N2v (formerly trH3N2), which is a reassortment of the swine H3N2 virus with the Matrix (M) gene segment from the 2009 H1N1 virus. So far, the number of cases has been small, and while some human-to-human transmission appears to have occurred, the CDC has not seen evidence of sustained and efficient transmission in humans. The last reported human detection goes back to March of this year (see CDC Update On Utah H3N2v Infection), but overnight local media outlets and the Associated Press are reporting on a small cluster of H3N2v that occurred recently, apparently in connection with infected swine at the LaPorte County Fair (held July 8th-14th). INDIANAPOLIS (AP) — Health officials say four people who've developed flu-like illnesses all had direct contact with swine at the LaPorte County Fair in northwestern Indiana. 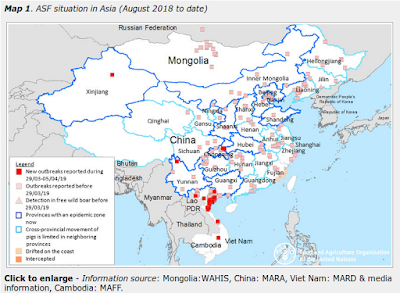 This short report goes on to say that the ISDH has confirmed a `variant influenza A virus’ in these four people, and that the same virus has been isolated in local swine. While H3N2v is not directly identified in the AP report, it does appear prominently in other reports, including this lengthy one from the local CBS network affiliate WSBT (includes a 3 minute video newscast). The Indiana State Department of Health, Centers for Disease Control and the USDA National Veterinary Services laboratory in Iowa found 4 people and all 12 randomly selected pigs from the LaPorte County Fair swine barn had what’s called influenza A (H3N2)v – a strain of influenza in the same family as swine flu. While only 4 new human cases have tested positive for the virus, WSBT reports talking to the parents of a number of children who also fell ill with flu-like symptoms after visiting the pig barn. According to this report, some local citizens have expressed deep concerns over the handling of this outbreak at the fair, stating that organizers did not quarantine the pigs even after 41 were found to have high fevers. In the past, we have seen reluctance on the part of some hog farmers to test their herds after the bad publicity their industry suffered during the 2009 H1N1 (`Swine Flu’) pandemic (see Swine Flu: Don’t Test, Don’t Tell). As to the exact strain in this outbreak, the reports are calling it H3N2v and suggest that it is the same strain that has previously been detected in 13 people over the past 12 months. We’ll obviously be interested in a more precise description from the CDC in the coming days. Swine are highly susceptible to the influenza virus, and are capable of serving as `mixing vessels’, allowing them to reassort into new hybrid strains. When that happens, once in a great while a swine virus can emerge that is capable of spreading in humans. While the number of confirmed H3N2v infections remain small, the CDC is obviously concerned and has ordered enhanced surveillance, testing, and reporting around the country as to better gauge the prevalence of this virus. In January we learned that the CDC was working on a vaccine candidate (see H3N2v Vaccine Trials), in the event this virus ever develops `legs’. And earlier this year the CDC Released Updated H3N2v Interim Guidance documents. For the most part, these documents provide background information, context, and a bit of advice for specific groups on the emergence of this new variant virus. Seventeen cases over a year’s time (even assuming a substantial number of undetected cases) does not a pandemic make - and so far at least - we are not aware of this virus causing any serious illness or death. This virus has, thus far, mostly affected children. In April of 2012 we saw a study (see MMWR: Antibodies Cross-Reactive to Influenza A (H3N2) Variant Virus) that found that children under the age of 10 had few or no cross-reactive antibodies to the H3N2v strain, suggesting they would be the most vulnerable age group to the virus. However, another study I blogged about in Eurosurveillance: Older People May Be Susceptible To The H3N2v Virus suggests that acquired immunity to this virus may wane over time. Although this swine flu variant could one day evolve into a greater public health concern, it could also up in the evolutionary dustbin of failed organisms; little more than an interesting footnote in the history of influenza in the 21st century. For now, the threat to the public appears low, and we remain in a watchful waiting mode. But anytime a virus jumps species – as this one has - we are particularly attentive. For more on the H3N2v virus, you may wish to revisit some of these older blogs. What is a variant influenza virus? Can humans be infected with swine influenza viruses? How common is it for humans to be infected with influenza viruses that normally spread in swine? Why are human infections with variant viruses of concern? What symptoms do people have when they are infected with variant viruses? Can people catch swine flu/variant flu from eating pork? How are variant influenza viruses spread? How can human infections with variant influenza viruses be diagnosed? What medications are available to treat variant flu infections in humans? What other examples of outbreaks with influenza viruses that normally circulate in swine are there? Was the “2009 H1N1” pandemic virus the same as previously circulating human H1N1 viruses?